Bull Creek Park Austin Texas. This forty-eight-acre park and swimming hole is an underused gem. 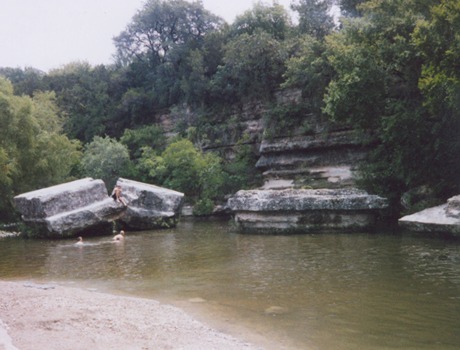 It was acquired by the City of Austin in 1971 with some federal assistance, and is a very natural park. Bull Creek cuts through a steep granite ridge where it flows over a small man-made dam. The dam forms two pools. Behind the dam the water is deep enough to have a rope swing and is framed by large boulders. The water cascades over the dam into a shallow area with fish and a gravelly bottom. Water levels will vary with rainfall. There is no lifeguard on duty. Bull Creek Park is very popular with dogs, so you just might have to share the pool with them. Often you must drive through a low water crossing, so be careful. This is a spot in Austin that always floods first when it rains. The park also has plenty of parking, a volleyball court, picnic tables, and a large, permanent grill. Rock climbers use the face of the granite ridge to practice. The park is close to Loop 360 so you may hear the traffic in the distance. Oak, pecan and juniper trees provide plenty of shade. 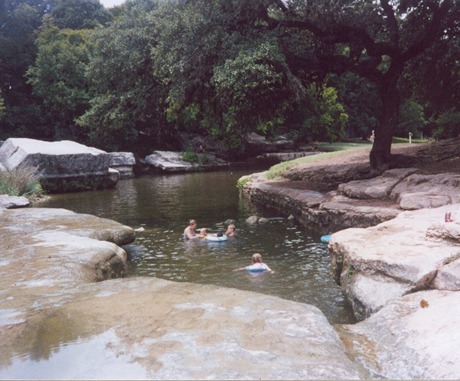 The Bull Creek Greenbelt begins at Loop 360 and Spicewood Springs Road and then travels south along Bull Creek through the park. The 3-mile trail is under construction by volunteers of the Bull Creek Foundation with no public funding. The Barrow Preserve is ten acres full of Bull Creek tributaries in northeast Austin, dedicated by David Barrow's family in 1974. There is a small, permanent spring with lovely columbine blooming in the springtime. The trailhead is at Stepdown Cove.